Welcome to the fifteenth day of 31 Days of Simple Organization! To read all the posts in order, visit the Overview Page. My family loves drinking hot tea and hot chocolate in the fall and winter! The problem was that gathering supplies was always a hassle. Sugar in one cupboard, mugs in another, tea bags and cocoa mix all the way across the kitchen… Just getting everything together took several minutes. Brilliant! I immediately knew I needed one of those. And then my mom gave me a little hutch that no longer fit in her dining room, so I got to work. First, I moved my girl’s play kitchen out to their playhouse to make room for the hutch, then I busily added some items from around the kitchen. 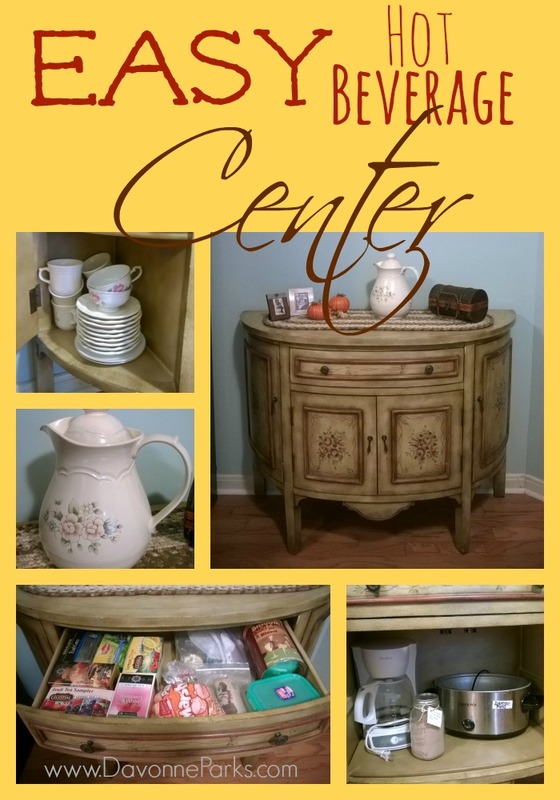 Grace and I put coffee mugs, tea cups, and saucers on one side of the hutch, travel mugs and Styrofoam cups on the other side, and the bigger supplies like a coffee pot and crock pot in the middle (see main photo above). Next, we moved beverages over! The drawer houses all of our tea bags, hot cocoa mix, cinnamon sticks, marshmallows, etc. The little basket on top holds sweeteners (sugar and honey), and the pitcher is perfect for holding smaller amounts of hot liquid when we only have a few guests. 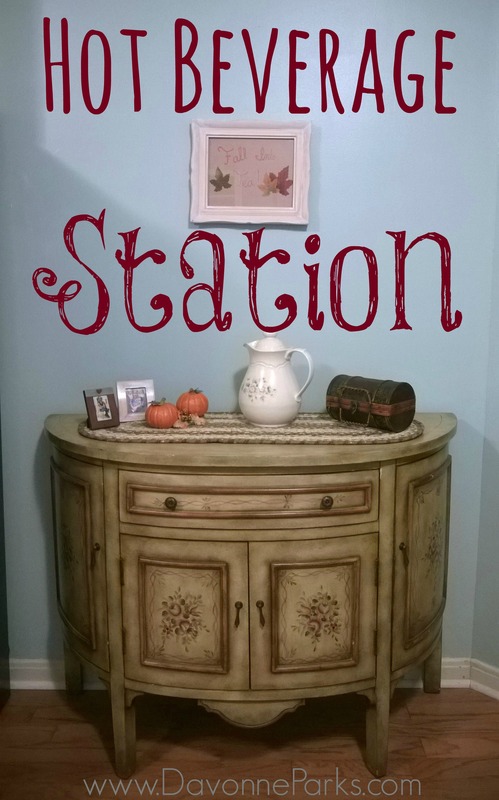 Finally, Lily finished the look by creating seasonal signs to frame above the hutch! Now, we’re not only drinking hot beverages in the fall and winter, but we’re also easily preparing tea when we’re sick. Or on chilly, rainy days in the spring or summer. Or just any other time that we want! As a bonus, hostessing is now a breeze. I just put a teapot of water on the stove, then introduce guests to the hot beverage center. Kids and grownups alike love getting to pick out their own mugs and tea or hot chocolate flavors! Today’s simple organization assignment: Using what you already have on hand, take a few minutes to corral hot tea and/or hot cocoa supplies to make a cute and cozy space for your own hot beverage supplies! PS You may also like this article about six simple ways to welcome fall into your home or this snowman soup recipe with a printable poem.